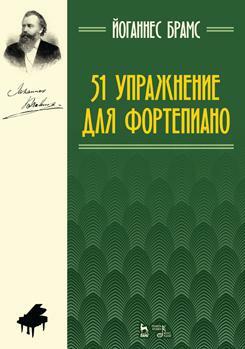 51 упражнение для фортепиано. Ноты. 3-е изд., стер. Collection «51 Exercises for Piano» (German «51 Übungen für Pianoforte»), created by famous German composer Johannes Brahms, is a kind of encyclopedia of piano technique. The collection includes original and various exercises: gamma-shaped and arpeggiated passages, various five-fingered formulas, double notes (in thirds, in the sixth, mixed forms), chords, polyphonic and polyrhythmic techniques, different types of articulation, stretching exercises. In this edition, the notation text is preserved in the form in which it was published by the author. The book is addressed to pianists, teachers, students of music schools.